The cascodes are used generally to increasing the output impedance of a current mirror. But sometime this is not enough. After all a ideal current source has infinite impedance so we must always try to achieve this very high output impedance. 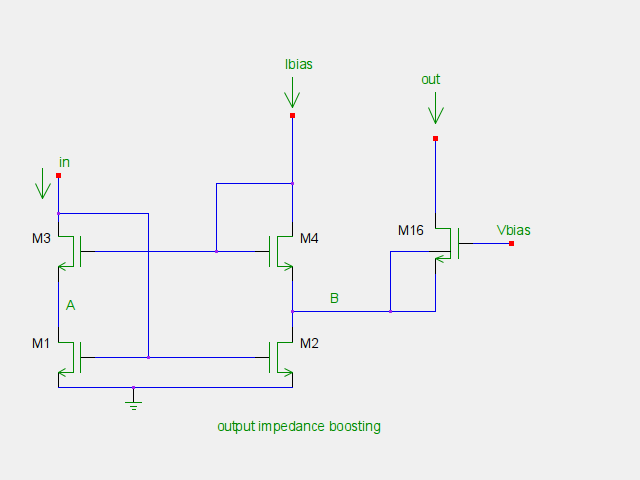 Usually to increase the output impedance a gain is needed to “boost” the performance. This “classical” way is to use a opamp or a simple MOS transistor to acheave this. The solution that I want to present here is simple and give good results. M1-M4 form the classical cascode topology. The M16 current flow in to M2 so the size of M2 must be bigger than M1. Usually is 2x, 4x bigger. The input voltage for this current mirror is VGS1 = Vt+Von. The input impedance is 1/gm1 = small = in the order of kOhms. The best value of Vbias is Vds2+Vgs16. This can be obtained with a replica type of circuit.